Tracking away from other skydivers well is one of the most vital survival skills a skydiver can have. 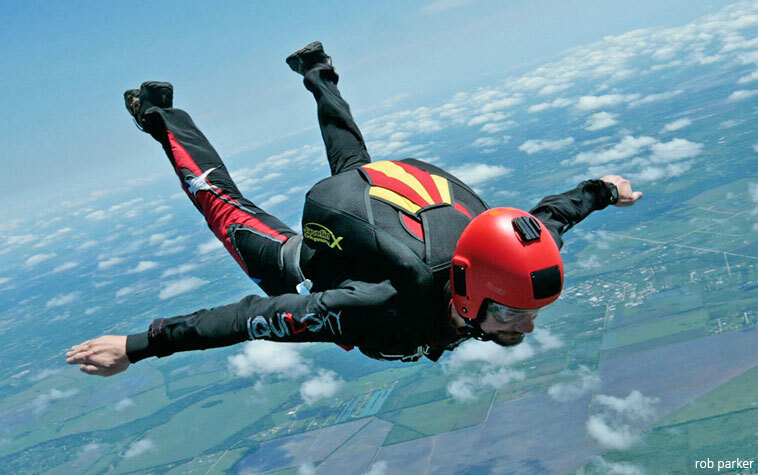 No matter what kind of freefall skydive you do, unless it’s a Mr. Bill or a solo, you will be tracking to achieve horizontal separation from the other people you are skydiving with before deploying your parachute. Failure to track well and straight can result in collisions with other skydivers as you deploy, with potentially fatal consequences. For these reasons, tracking well and straight is also an absolute requirement to do larger-way skydives. Big-way organizers will cut you from the jump if you can’t track, and sometimes you’ll get invited just because you can. Tracking is a skill we may think we have when we graduate from the Skydiver Training Program, because we had to do it properly to pass the upper levels, right? However, just like most other skills you learned as a student, the track you learned in the program is only a starting point. As you jump more and more, you should continue to work on tracking better (flatter and farther) on every jump. Let’s talk about what that means. Compared to the delta track you learned as a student, a flat track is one where you fall slower and move forward more rapidly (a flatter glide slope). 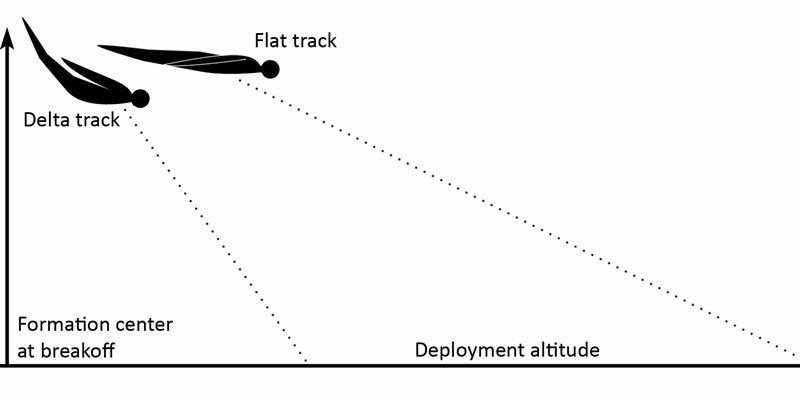 In the same amount of altitude (i.e., from breakoff to deployment altitudes), a skydiver tracking flat will gain more horizontal separation from the center of the formation than someone in a steeper delta dive. Simply because it will save your life. The goal of breakoff and tracking is to get as far as possible away from those mofos you’ve been flying with so you can all deploy your parachutes in clean air. It has often been said that you have no friends below breakoff, and this is very true! If you’re close to others horizontally, if the low jumper pulls (or if the high jumper cuts away), the high jumper who’s still in freefall can fall through the low jumper’s canopy as they decelerate. Or an off-heading opening between jumpers who are near each other horizontally can result in a canopy collision/wrap. None of these scenarios carry high expectations of survival. Particularly with highly loaded canopies, you might be surprised at how much ground they can cover just after opening, even with the brakes stowed. Not one of us is immune to a collision based on experience or time in the sport; only through good breakoff plans, constant awareness of others around us, and good tracking technique can we reduce our risks of collisions during breakoff and deployment. You may ask, “If flat tracking is so awesome, why didn’t I learn it as a student?” Excellent question! Most students are not taught a super flat track because it is a less stable body position with a higher center of gravity, and thus harder to master. As a student, if you are able to break off, track straight, and pull on time, you will pass the tracking requirements. The student delta track maintains a good arch, legs straight with feet slightly apart, and arms swept back in a triangle shape with your body. When you transition into this body position, you may feel that you’re covering a lot of ground because you can feel and hear the increased wind noise. However, a significant part of this acceleration is downward, which doesn’t help out your horizontal separation goals at all. In comparison, a flat track body position has the legs tight together and straight (with toes pointed), front of the body completely straight to very slightly de-arched, and arms tight to your sides. You are turning your body into a single efficient wing with more lift, and as such it should have smooth, straight lines. In this body position, you will fall slower than your normal neutral belly position and achieve significant forward movement. Gradually straightening your legs further, locking your knees, and bringing your legs together. Bringing your arms back tight against your sides, palms down. Thinking of de-arching slightly (which will probably just put you in a flat body position, which is great). Think of pushing your straight legs down, parallel to the ground, and hanging your upper body just below them. It should feel like an ab crunch, and if you did it for an entire full-altitude skydive you’d probably be sore in the morning. If you need to adjust your heading in this body position (say, to avoid someone tracking too close to you when you have space on the other side), you can do so by ever-so-slightly banking a shoulder in the direction you want to turn. Remember your priorities at breakoff: Check altitude, pick a good heading, extend legs, then sweep your arms back. Once you achieve this effective tracking body position, use it and refine it on every skydive. If you think your flat track is good enough… it probably isn’t! Never stop working on your track, because it certainly can’t hurt and it WILL save your life. We sometimes see heavier jumpers tracking lazily because they think they can’t track well with their body type. We also sometimes see lighter jumpers track lazily because they figure their long limbs and light weight mean they are guaranteed to track well. Neither is true! Regardless of your body type, you can probably track a lot flatter than you think by using these techniques. I’ve seen many a lightweight jumper get passed up by heavier jumpers who tracked with better technique. Also, large-framed jumpers have some advantage in that their wide shoulders have a lot of surface area to generate lift. If you don’t know where everyone from your group is at breakoff, make sure you turn, then check in front of you before blasting off away from the formation. It won’t do anyone any good if you track into someone who was trying to get back into the formation just before breakoff. You can cover a lot of ground with this body position. As such, if at breakoff you are oriented directly up or down line of flight towards other groups, especially if you have a high breakoff altitude, you may end up in other groups’ airspace. Consider tracking not quite as hard as you are able, or divert your tracking heading off line of flight if that doesn’t interfere with other jumpers in your group. Maintain awareness of other skydivers in all directions as you track. 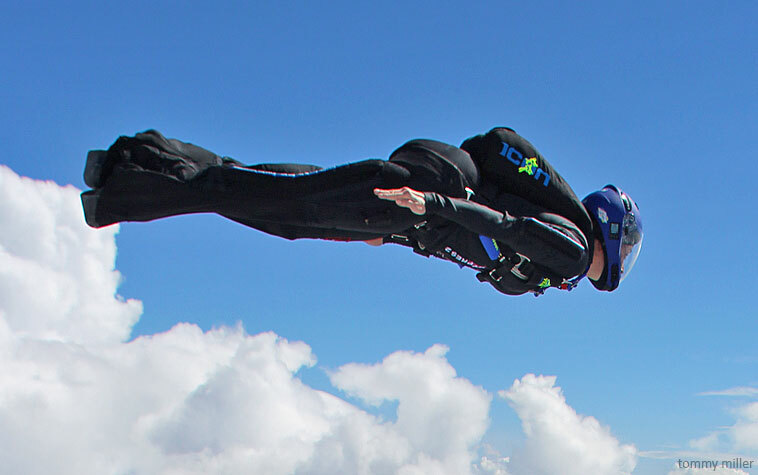 Especially on big-way skydives, jumpers may be in all of those directions and small adjustments will help you gain even more separation from them. Be able to track while scanning in all directions. You will never know how many incidents you avoided by tracking well–and that’s A-OK. See you later! Don’t miss the other articles in our breakoff safety series! Try flat tracking with palms up. On the ground assume your regular flat track position with palms down, then rotate palms up. Notice that the shoulders room slightly forward and down, thus creating a better airfoil position in your body. Rotating the hands gets the cupping you want, but keeping the palms downward is more straightforward. What I teach is to get the hands placed down near the hips, not tightly against, but brushing them. Then you shrug your shoulders up and forward, which causes the nice concave indentation that rotating them does. I will then put my hand into that spot where the collarbone hits the shoulder, and say that we’re trying to get every part of the body to cup air. If they can tuck in their belly to cup air there, that’s terrific. This is a good place to reiterate that getting every part of your body to generate lift is the goal. Prolonging the track (and freefalling time) by not losing altitude gets you further from the other people on the formation. It’s hard to practice this on a long “tracking dive”, unless it’s a small group with people of a similar body shape. My 6’5″ body tracks differently from someone 5’8″ of the same weight, so getting just one or two partners is best for practices.